I have always wanted to get a tattoo. I can never decide what I actually want to get and where to have it placed. Last night, I went to Ryan and Briana's house. 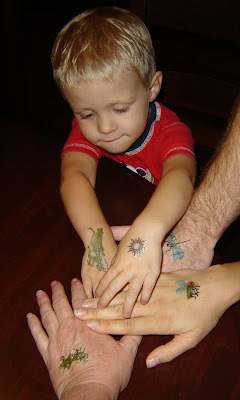 Dylan and I decided everyone needed a tattoo. 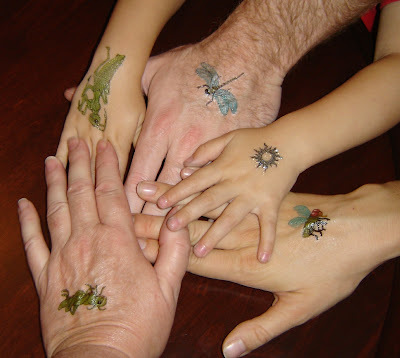 His Mom wasn't too keen on the idea of an insect tattoo, but she eventually gave into peer pressure. A group pose. As you can see, I am not as ashamed of my hands as much as my feet. Next week, maybe snake tats??? How about kitties and stars, bumblebees and trains? 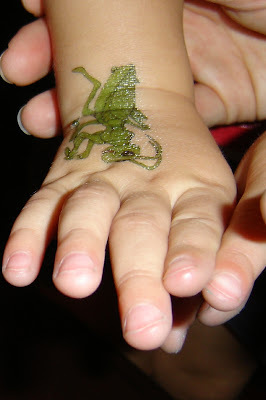 I vote for Godfrey's Mama to get a real tattoo for her birthday next week!! Happy birthday!! I wish you were here! I would need someone to hold my hand while I got that tattoo!